snatched and played should the urge to work something out hit. parts of my previous article & rework them into this new one. resembles an upside-down "U"). 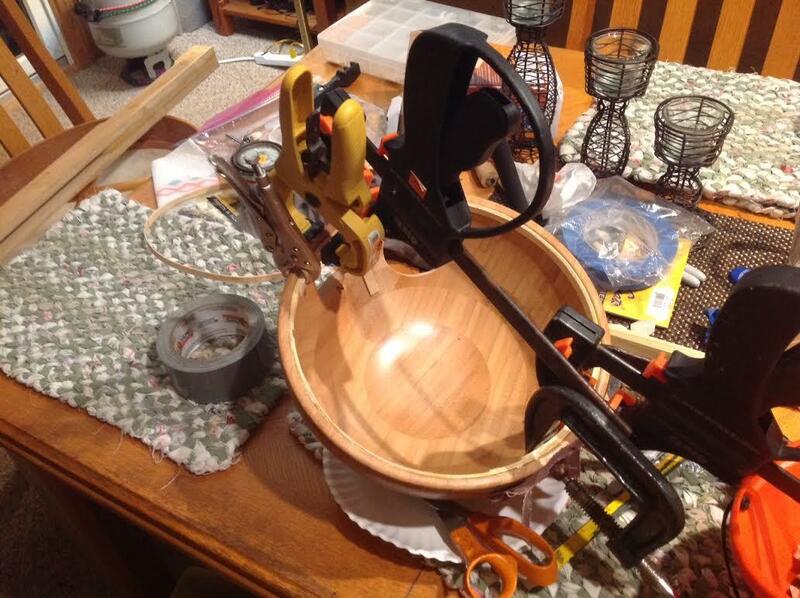 The sandwich is Titebond glued, clamped and left to set overnight. 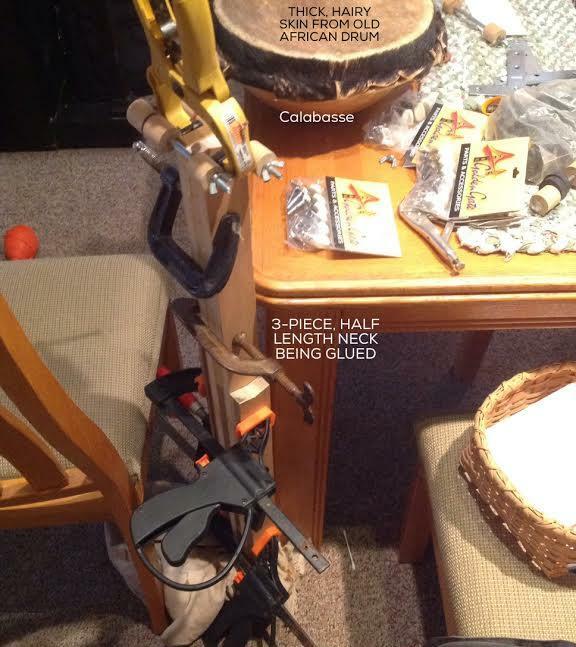 monofilament nylon fish-line riding over hardwood only causes minimal "indentation". In the past, I've used "no bushings" a lot with no trouble. 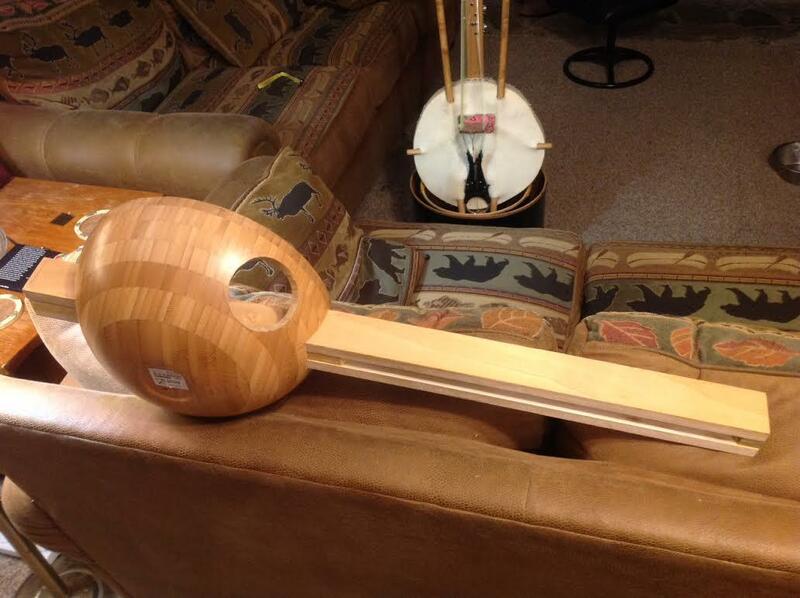 softwood such as pine work fine for a Kora neck! 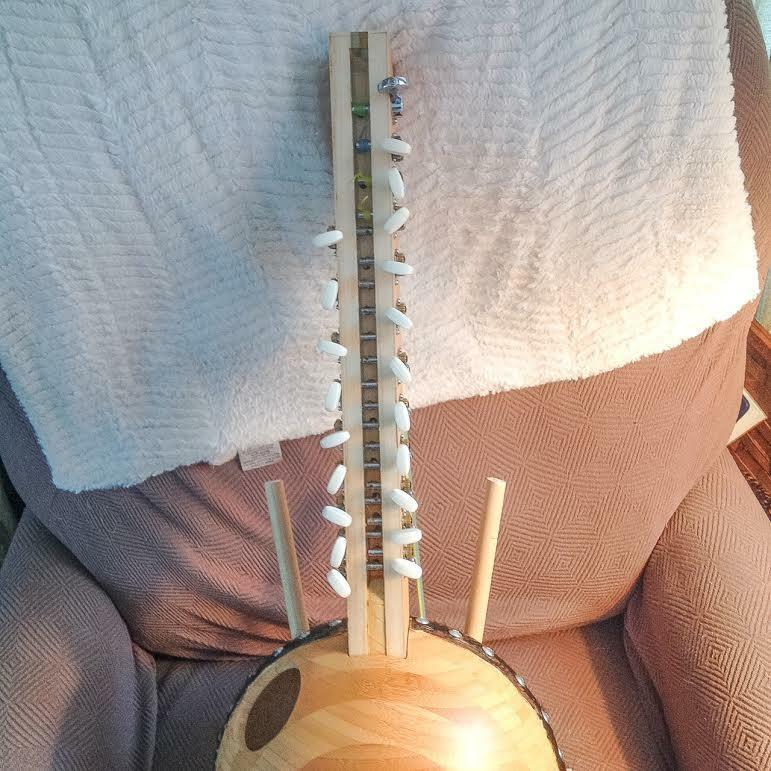 A little neck bend is absolutely ok.
My "cookie-tin" Kora's neck is pine and it's well into it's third decade with no problems. 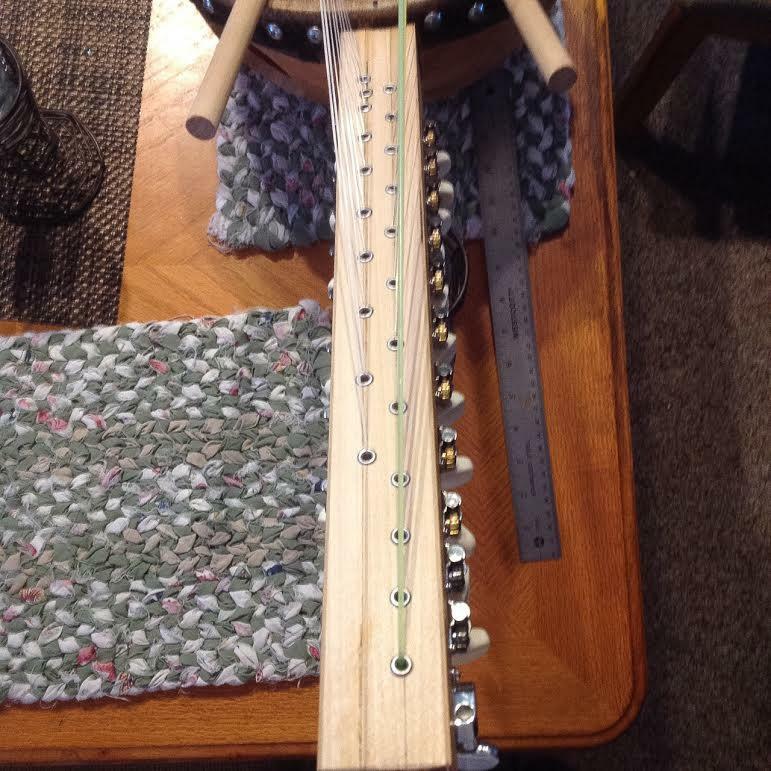 I used a slightly beefier guitar tuner, for the lowest-pitched, thickest string. 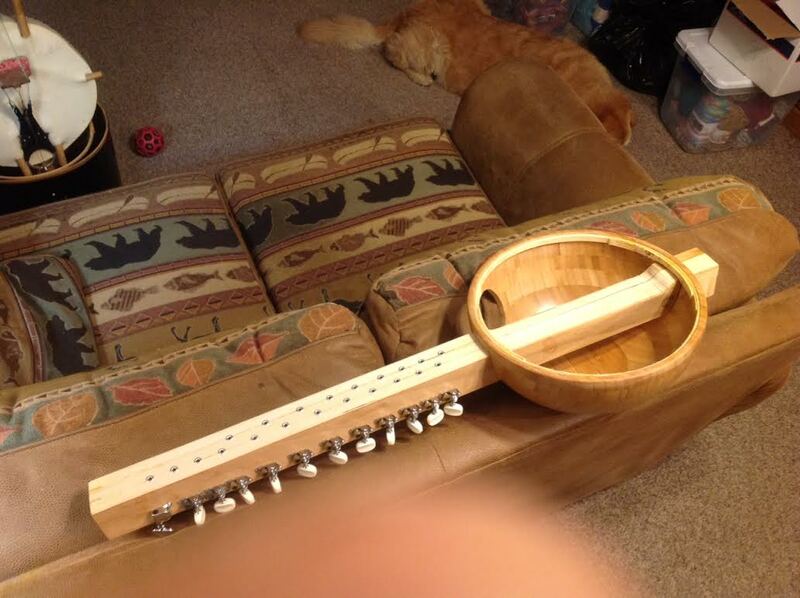 the added weight of the bowl kind of 'balances out' the instrument - makes it less neck-heavy. 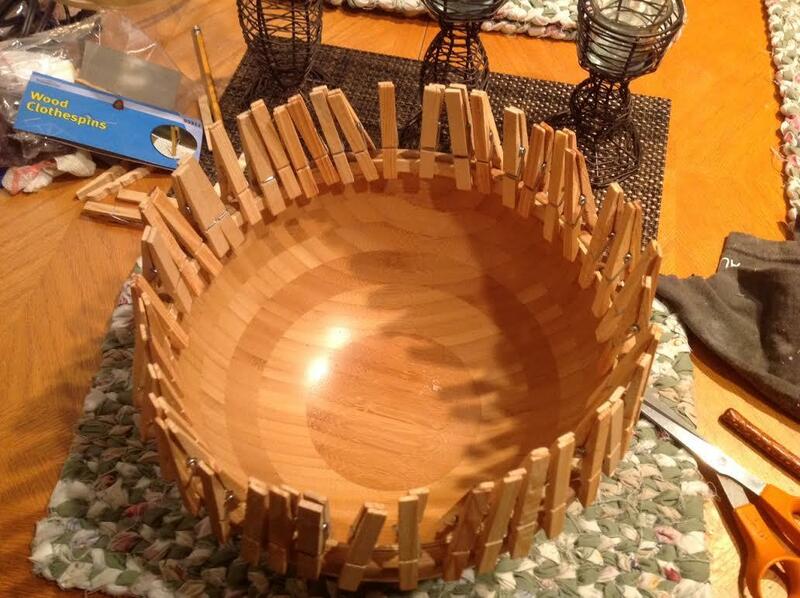 material to the bowl's inside. or three inches) out of the best looking, thickest part of your hide. glue in these areas - really does help the skin stay in place. skin on a towel, double the towel over to soak up surface water on both sides. skin as tightly as possible, plot, pre-drill and mount two or three more screws. while drying. I space screws about a half inch apart, as evenly as possible. of days go by and the skin continues to dry, keep tightening all the screws. repetitive drilling, glueing/clamping and tuner installing. This neck is made like a sandwich. 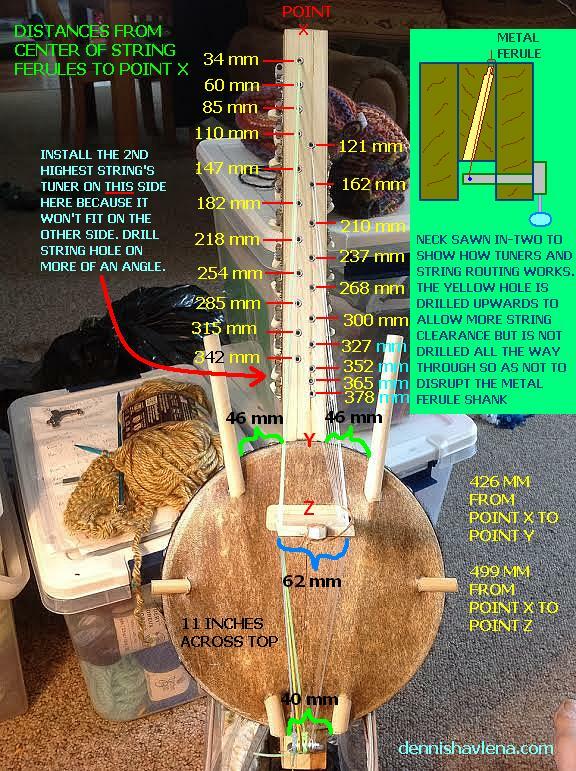 each peg shaft. Into these holes I inserted REWORD guitar tuning machine bushings. I've used "no bushings" a lot with no trouble. 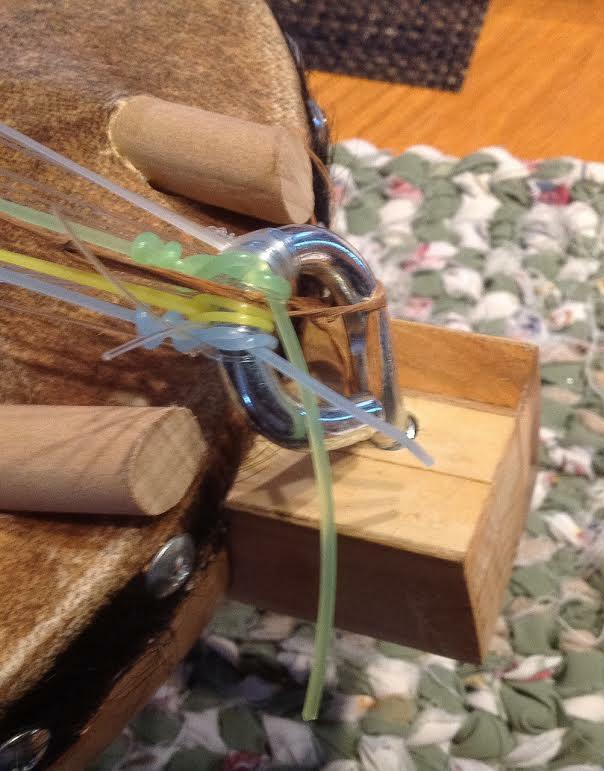 I got my bushings from a "Michael's"
the chance of unwanted string buzz & keeps the string firmly on the bridge. works equally wel. 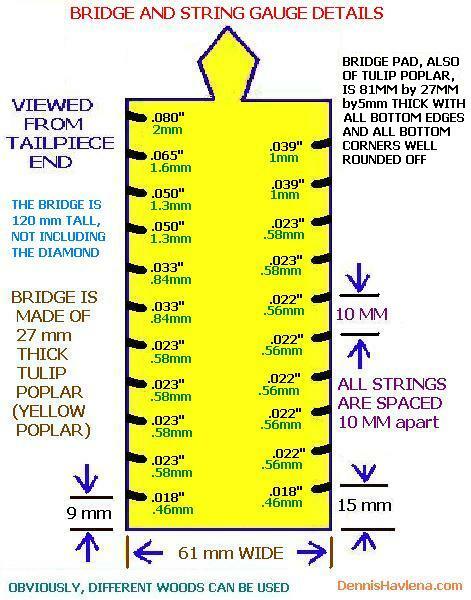 Note: with full string tension, the bridge will "sink" considerably. eye-bolt with it's head hammered into backwards angle towards the bridge..
weed-whip line. Lately grooved, ridged and square line is being sold - avoid it. only micrometer I have) in the bridge diagram above. down. 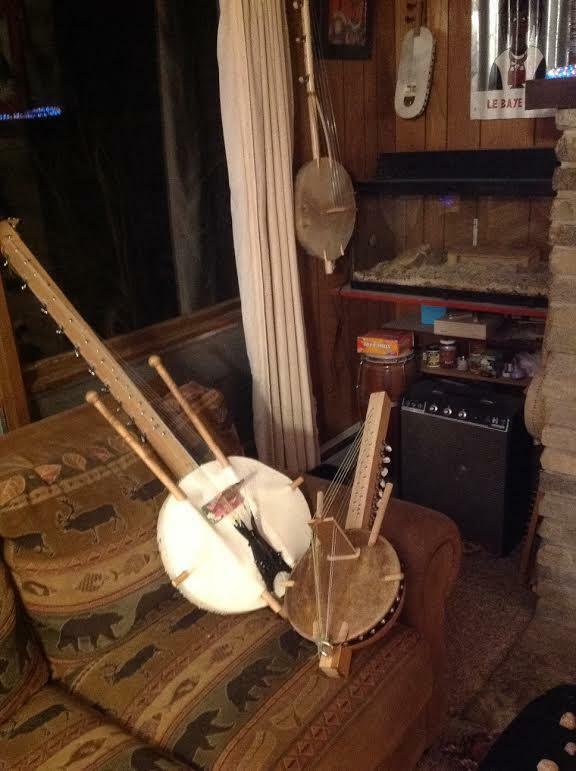 Once thus settled, the instrument can go for months without requiring retuning. It's not only the strings that stretch & settle -- the skin head does so as well. Also, the bridge settles down into the head & various other wrinkles will likely appear. immediately above "middle C" on a piano. 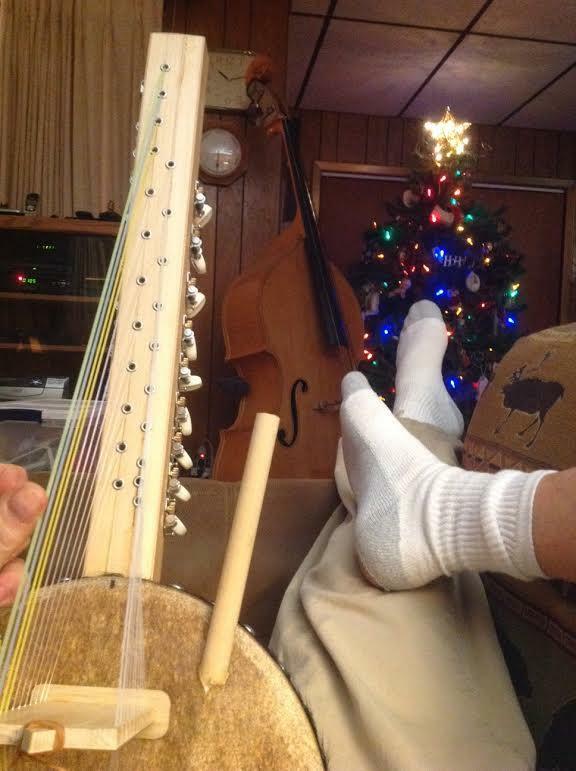 As I get older, I like to play instruments laying back lazily. 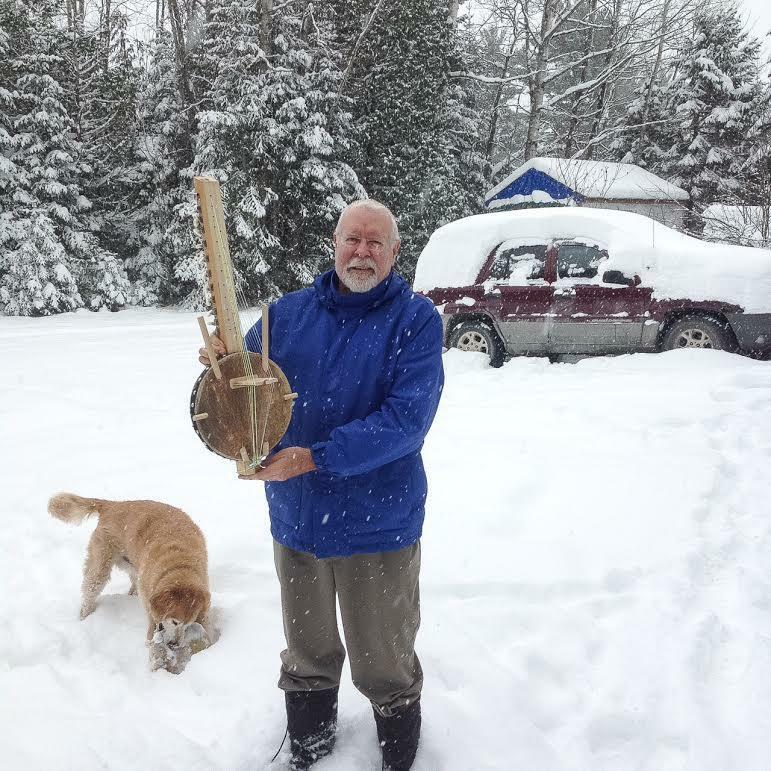 Hard to do with a full-size Kora but easy to do with this tiny one! Commernt, Ideas? Thanks! I'm all alone in the kora wilderness up here.